…little black dresses, hugs, Reese’s peanut butter cups, laughs, or deviled egg recipes. Or deviled eggs, for that matter. Or could you? Actually you probably could and I probably have, on all of the above. Except little black dresses. Ok, the food. It has been a work-y work-y summer but if I were just chillin’ at BBQ’s (we shall not call them “‘ques”) I’d bring these then be the annoying guest wanting to borrow the friggin’ oven, mid-summer, to toast the crumbs on top of these. 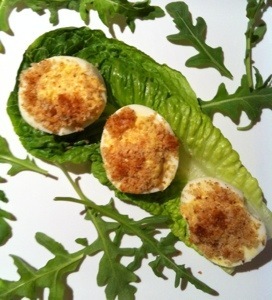 A warm, crumbed, deviled egg sounds weird but it’s a bloody revolution. Not terrible leftover and cold, either. Turn on the broiler. Mix yolks, mayo, horseradish, vinegar, mustard, and salt. Use to stuff whites. Sprinkle bread crumbs over and spritz with olive oil spray. Broil only until crumbs brown, around 2 minutes. Eat hot but they are good chilled too! YUM! Can’t wait to try it. Horseradish! Yes! The horseradish makes it. If only I could take credit for it, but Bon Appetit had the genius. My mom is obsessed with horseradish. I can already see her being all over this recipe. Emailed her with the link! Awesome, thanks for sharing the link with your mom. And thank you for the comments. I checked out your blog too-I love the name! Im a lover of deviled eggs! There was a period of time that I made egg everything and my roomate was pissed b/c the house smelled pretty rotten LOL but I never thought of horseradish in my eggs…Will Try!